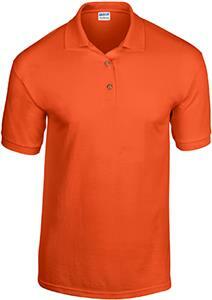 Gildan DryBlend Adult Jersey Sport Shirt Polos. Contoured welt knit collar and cuffs. Clean finished placket with reinforced bottom box. 3 woodtone buttons. Double-needle hem. Allow an extra 3 business days for embroidery. Need to personalize your items? Add them to your cart first, and then customize as needed. Note: Chest width is on the half so the measurement needs to be doubled for total measurement. (ON THE HALF) 18" 20" 22" 24" 26" 28" 30" 32"
LENGTH 27.5" 29" 30" 31" 32" 33" 34" 35"
SLEEVE LENGTH (TOP) 8.5" 9" 9.5" 10" 10.5" 11" 11" 11"
SLEEVE LENGTH (CBN) 17.25" 18.75" 20.25" 21.75" 23.25" 24.75" 25.75" 26.75"
SHOULDER 5.75" 6.75" 7.5" 8.5" 9.25" 10.25" 11.25" 12.25"
Note: UPS DOES NOT DELIVER ON SATURDAY OR SUNDAY, regardless of shipping method selected. Would you like to view the available embroidery options and costs before adding this product to your cart? Great price, fast shipping, great shirts! Good communication too!